Face fit testing is now a legal requirement for anyone who wears a tight (or close) fitting mask for work. The supporting guidance for COSHH (Control of Substances Hazardous to Health), CLAW (Control of Lead at Work), CAR (Control of Asbestos Regulations) and the Ionising Radiation Regulations stipulate that face fit testing should be carried out as part of the initial mask selection process. What does the test involve ? 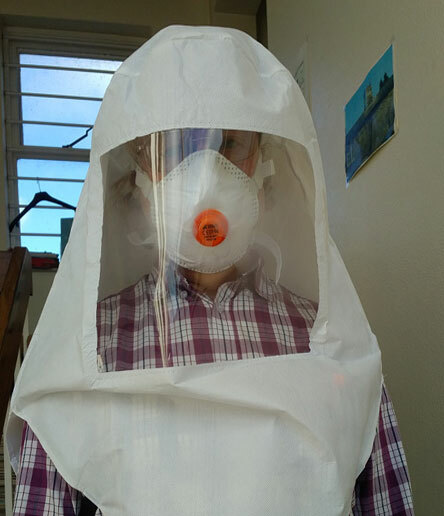 The qualitative test can only be carried out on half masks. The test takes around 20 minutes and involves wearing a hood over the head and shoulders. The tester sprays a bitter tasting solution into the hood whilst the delegate carries out a series of exercises, i.e. turning head from side to side. If the wearer can taste the solution, then the mask does not fit correctly. How often should a fit test be carried out ? - develops facial changes, i.e. scarring, moles etc. in the face-seal area. We can arrange in-house testing for larger groups or individuals can book and attend our office for face fit testing.